did not attempt; we sent Dave instead! Earlier this week, we took the innpugs on a hike in Montreat called the Lookout Trail. Montreat is mostly known as being the town where Rev. 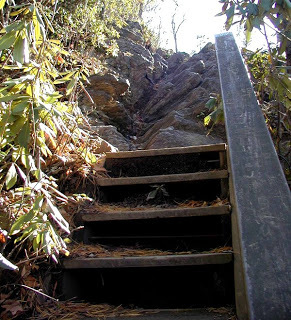 Billy Graham lives; however, it is also home to 20 outstanding hikes. Lookout Trail is a half-mile, moderate, 45-minute trail that crosses the Old Trestle Road, which is part of the logging railroad route from Black Mountain to Mt. Mitchell used in the early 1900s. The Trail then heads steeply up to the summit of Lookout Mountain (3,760 ft) that looks over Montreat and a range in the Black Mountains called the Seven Sisters. 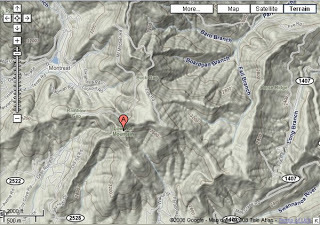 Here’s a screen capture from Google maps that shows Lookout Mountain (the red dot marked “A”). You can click on the photo to enlarge it. On the far right, you can see two ridges. The Inn on Mill Creek is located between those two ridgelines a little bit above where it says “Long Branch”. The Town of Montreat, which led us to the Lookout Mountain trailhead, is to the left of Lookout Mountain. The innpugs enjoyed their hike immensely. 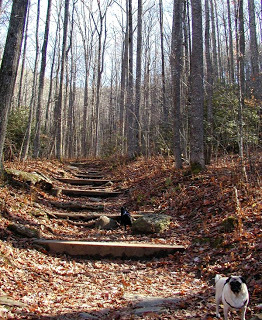 Since the trail heads up and up and up, several landscaping timbers form long stairs on parts of the trail. Csaba needed a little bit of help on the highest of the timbers, but Bugsy had no trouble at all, skipping along like a little mountain goat. We highly recommend bundling up and going on a hike if you’re in the area in late Fall. We’ll be happy to help recommend a hike or two. Now that the leaves are mostly gone from the trees, the views are spectacular. This entry was posted in Uncategorized and tagged Autumn / fall foliage, hiking, innkeepers and innpugs, Montreat by Inn on Mill Creek. Bookmark the permalink.